Mt. Zion United Methodist Church has been an integral and viable part of Georgetown and has served the religious, educational, and social needs of a significant portion of the Washington community for more than 200 years. In the early 1800s, Georgetown was a major port for the tobacco and slave trades, as well as a manufacturing center of foundries, mills, and cottage industries for the newly created city of Washington. Georgetown’s population was one-third black—half freedmen and half slaves. Mt. Zion’s historical roots in Georgetown precede its actual establishment in 1816. The founders, along with other free and enslaved black Methodists, had been worshipping since the turn of the century at the Montgomery Street Church (now Dumbarton United Methodist Church) founded in 1772. At times nearly 50% of the Montgomery Street Church’s membership consisted of “coloured brethren.” From 1801 to 1810, their number fluctuated between 37 and 97. After 1810, the number increased substantially. Dissatisfied with the segregation they faced, some 125 of the black parishioners attending the Montgomery Street Church met on June 3, 1814 to consider forming their own congregation. They purchased a lot on Mill Street (now 27th Street) on October 1, 1816 from Henry Foxall, a white foundry owner and officer of the Montgomery Street Church. They built a church known as both “The Meeting House” and “The Little Ark,” which operated under the supervision of the Montgomery Street Church and was served by its ministers for many years. In 1844, at the suggestion of Reverend Stephen G. Roszel—an outspoken anti-slavery leader and pastor of the parent church, the name was changed to Mount Zion Methodist Episcopal Church. In the following years, Mt. Zion’s standing in the black community of Georgetown and greater Washington continued to grow. The church not only provided spiritual sustenance to a large segment of Washington’s black population, but also became an education, civic, and social center. Educational opportunities for blacks prior to the Civil War were extremely limited, and the church’s Sabbath School, organized in 1823, promoted the educational progress of adults, as well as children. From 1840 through Reconstruction, several schools sponsored by the Pennsylvania Freedmen’s Relief Association and other organizations were housed in the church. Until the abolition of slavery, Mt. Zion served as one of the stations on the Underground Railroad. The vault in the Old Methodist Burying Ground was used as a hideout for runaway slaves until their passage north could be arranged. Despite its prosperity, Mt. Zion was confronted with divisive organizational and leadership issues, specifically the call for black ministers to preside over black churches. By 1849, dissention over this issue led to several members leaving the church and organizing Union Wesley African Methodist Episcopal Zion Church, John Wesley African Methodist Episcopal Zion Church, and Ebenezer African Methodist Episcopal Church. A black minister would not be appointed to Mt. Zion until November 1, 1864, when Revered John H. Brice was named. In 1879, Mt. Zion leased for 99 years the unoccupied east end of the Dumbarton Avenue Methodist Church Cemetery “for a sum of one dollar in hand” as a burial ground for its members. On this site located on Mill Road (behind the 2600 block of Q Street) were buried a part of Dumbarton’s congregation, slaves of some of its members, black Civil War veterans, and others from Washington. The west end of the cemetery had been purchased by the Female Union Band Society for the burial of free black people. Through the years, the two cemeteries have been considered jointly as the Mt. Zion Cemetery. In 1950, interments ceased. Mt. Zion remained in its original location until the structure burned down on July 13, 1880, and, thereafter, services were temporarily held at the Good Samaritan Hall on what is now 26th Street. Fortunately, the congregation had already purchased a lot in 1875 for $2,581.00 from Alfred Pope, a black, Georgetown businessman and a trustee of Mt. Zion. The present site of Mt. Zion is on this lot. Construction of Mt. Zion was carried out by black artisans, including one of the pastors, the Reverend Alexander Dennis and his associate, the Reverend Edgar Murphy. The cornerstone of the church was laid in 1876 and re-laid in 1880. On October 31, 1880, the first service was held; the flooring was complete, but the building was without a roof and plaster. In July 1884, the church, with its beautiful stained glass windows and intricate hand carvings, was dedicated. Mt. Zion’s physical plant continued to be improved and extended. Construction of the parsonage at 2902 O Street was completed and opened on April 21, 1897. In 1920, Mt. Zion purchased an adjacent property for use as a community center. The lot included an English style cottage erected in 1811. The cottage became known as the Community House and was dedicated for service that same year under the leadership of Emma P. Williams, a social worker. Mt. Zion’s influence and standing in Georgetown and greater Washington continued to grow during its first one hundred years. The church faced numerous difficulties, dissentions, law-suits, and fires, yet it became one of the most prosperous and service-oriented churches in Washington. In 1896, the church membership numbered around 700 people. Mt. Zion was free from debt, and the edifice was valued at twenty-five thousand dollars. Throughout the twentieth century, Mt. Zion, along with other churches in Washington, was challenged by the political, social and economic upheaval of the times. Nevertheless, Mt. Zion persevered and survived the great migration of blacks from the south to northern cities, two world wars, a global economic depression, as well as urban renewal and gentrification of its neighborhood. During such periods, the resources of the congregation were stretched, but comfort and assistance were provided to needy brethren in Georgetown and in greater Washington. The church structure also underwent extensive improvements, including the complete remodeling of the Sunday School, the installation of modern bathrooms, as well as the procurement of a new Allan organ. Demographic and economic changes in Washington led to fewer and fewer members of Mt. Zion actually residing in the Georgetown. Beginning in the late 1930s and 40s, the demand for housing by whites in Georgetown resulted in the escalation of real estate prices, forcing many black citizens to leave the neighborhood where generations of their families had resided. By the mid-1950s, Mt. Zion’s membership extended to the far corners of the city and beyond. The realities of the situation forced the congregation to consider the question of whether Mt. Zion should move to another location or could it remain in Georgetown and fulfill its mission as a church and serve its members. One of the answers to the question was the acquisition of a bus to assist members with transportation. By the mid-1960s, the church owned three buses. During the latter part of the twentieth century, historical interest in “Black Georgetown” was spurred, in part, by the Afro-American Bicentennial Corporation. In 1975, the Mt. Zion Cemetery became a Historical Landmark of the National Capital and on August 6, 1975 was placed on the National Register of Historic Places. Because it has contributed significantly to the visual beauty and cultural heritage of the District of Columbia, Mt. Zion United Methodist Church was designated in June 1974, as a Category II Historical Landmark of the District of Columbia. It was also placed on the National Register of Historical Places on July 21, 1975. The Mt. Zion Community House is believed to be the only remaining English style cottage in the District of Columbia. In 1985, it was restored and returned to community use to help recapture the history and presence of the black community in the Historic District of Georgetown. The restoration was done with private funds, grants from the United Methodist Church, and a matching historic preservation grant from the District of Columbia. Today, Mt. Zion’s members include families whose forbearers date back to its inception. Only a few congregants reside in Georgetown; most are scattered throughout Washington and the Virginia and Maryland suburbs. Nevertheless, Mt. Zion’s members continue the tradition of service to the Georgetown community and greater Washington in the twenty-first century. 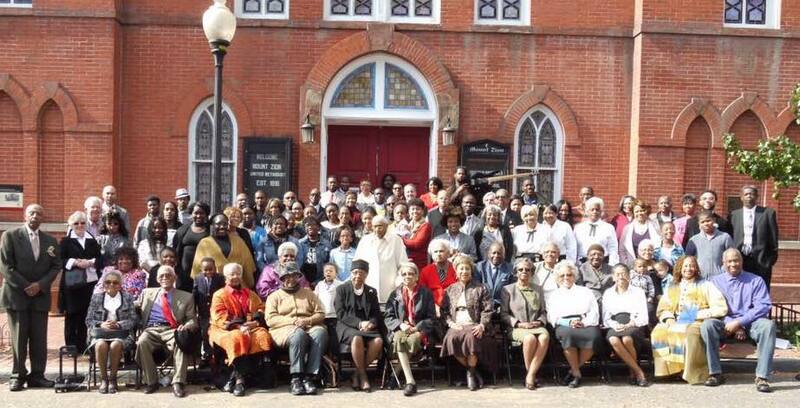 They are proud of and grateful to their ancestors for founding and sustaining this historic church. The congregation has a strong desire to maintain the continuity of Mt. Zion—the first black church in the District of Columbia—as it celebrates over two-hundred years of ministry in Georgetown. • Going where God sends us!